Welcome to the Seasons Giving Blog Hop where you will have so many opportunities to not only be inspired in your creative endeavors but to WIN some prizes being offered by the Blog Hop participants. It’s our little way of saying “Thank You” to those of you who so faithfully read our blogs and support our endeavors. We appreciate it so very much! There are somewhere between 75 – 100 participants, EACH OFFERING BLOG CANDY. So grab yourself a cup of whatever you enjoy, check out all the blogs and their offerings up for grabs. Be sure to read each blog for the details on their give-away. 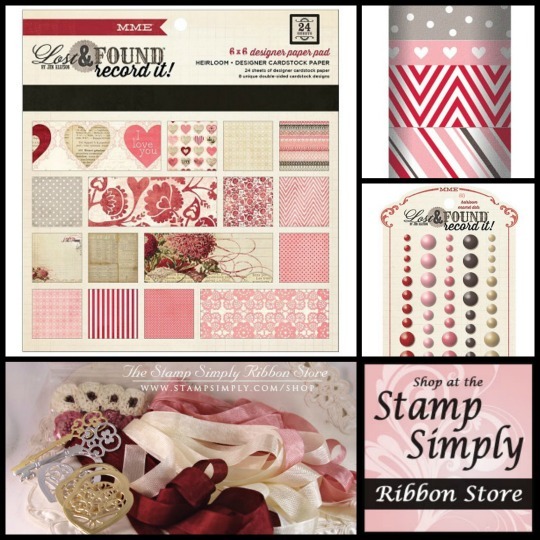 The Stamp Simply Ribbon Store is so pleased to be a part of this Seasons Giving Blog Hop. Our offering of blog candy will be shown further down and I think you’ll like it! However, I have a Valentine I made that I’d like to share with you first. This Valentine is a bit larger at 6.5 x .4.75″, made this size to perfectly fit into an A6 Clear Box for gifting. Here’s a closer look at the pretty details. 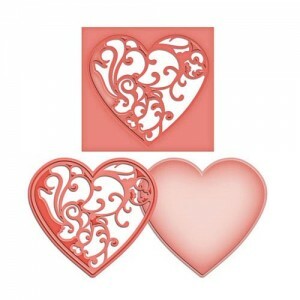 Key to My Heart by Kaisercraft – die cuts available as well. Smaller die sets at a smaller price, currently ON SALE, too! ALL Spellbinders dies and embossing folders remain on sale! This is what we have up for grabs as our blog candy offering. Cut from Gold and Silver Mirror Cardstock using Spellbinders Die D-Lites Love Locket Dies. 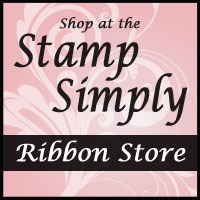 All items available at The Stamp Simply Ribbon Store, as shown. Simply leave a comment on this post telling me what your favorite style is for card making, if you had to pick ONLY ONE. Make sure you leave contact information in your comment. All comments through 6 p.m EST January 6 will be considered and a winner will be announced at 8 p.m EST on January 6, selected by a random number generator. We’d LOVE to have you come back to check out what we are up to and see all the beautiful work by our very talented Design Team. Michelle Woerner, one of our very talented DT members, is the next stop on this hop. 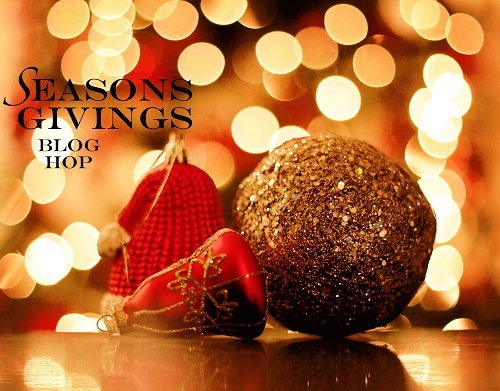 Thank you so much for joining our Seasons Giving Blog Hop. Please feel free to scroll down on this blog for more inspiration! We’d love to have you take a peek! Have a HAPPY NEW YEAR 2014. Be careful – be safe! We’ll see you all again real soon! Thanks so much for the chance to win! Such a beautiful package, and in plenty of time for Valentine’s Day! As far as stamping style… I try to keep a wide variety in my projects, but I find myself drawn to vintage colors and realistic images, especially of nature and life, and I love mixed media. Hugs and happy new year to you, Sharon! If I had to pick only one I’d pick mixed media because it includes so many other styles including my true fave, shabby chic! Oh my, what a stunning card and yummy blog candy! If I had to pick only one style, it would have to be collage. Love the layering of a design!!! My favorite is shaby chic……thank you for all your inspiration you give all of us. Happy New Year! Thank you also for the chance to win such wonderful blog candy as well. A happy and blessed 2014 to you and your family!! Thank you for the opportunity to win your fun stamping goodie box…….looks like so much fun! I’d say my style really varies but love the soft colors, more vintage style. Thanks for opportunity to be entered to win. I like to use a variety if styles depending on who is receiving the card. My favorite is vintage. Oh, boy, choosing one style is not easy. Let me think – If I could have only one, it would have to be CAS because they are quick to make & I run short on time most days ðŸ™‚ Happy New Year!! Your valentine is beautiful and the valentine goodies are perfect! My fav style is CAS but I have a terrible time keeping my cards CAS….it’s the weirdest thing. I plan to practice that in 2014 and will count on many of you very talented ladies for inspiration to help with that style and so much other goodness! Thank you & Happy 2014!!!! Choosing one style is tough but lately I’ve had to make a lot of sympathy cards, so am leaning on inspirational images and verses. Thanks for the prize. I would have to choose Clean and Simple as I mail most of my cards. Thanks for the chance to win. Wow! Your card is breathtaking. I love the details you added – AMAZING! If I had to choose one style, I would go for CAS. Happy New Year to you and yours and best wishes for 2014! If I had to pick one style, it would be CAS+. lol Not quite CAS, but a simple and fun/cute style. Happy new year…..beautiful. Cas is my style. I’d have to say whimsical. Copic colored whimsical images are just fun. I’ve tried to be serious, but it’s just not my style. Thanks for the blog hop! My favorite style of card making is to go to my table after a big project and create something on the fly using whatever is on the table. The challenge is fun and the cards always are some of the prettiest cards I make. I don’t know that I actually have a style but I love the challenges with a layout. Happy New Year ! Have enjoyed following your blog for quite some time now. As for my cards, I tend to lean towards CAS since I mail most of them. I do love some embellishments though. Beautiful card!! Love the blog candy. My Minds Eye is my favorite paper company. My favorite card style has layers and ribbon. Is there a name for that? Thanks for the chance to win. I’m a clean and simple card maker. Layers but no mixed media. Gorgeous card! My favorite style is mixed media/shabby chic. I sort of cheated because I had a hard time picking just one! LOL! I really like all kinds of styles but I would say those are my favorite. Thanks for a chance to win your fabulous prize!!! I tend to be a mixed up style crafter! Some days I feel CAS, some days I like to pile it on! Thanks for the chance to win some great prizes. Love to come and browse your website. I love all of the samples of the different designers. Your site is an inspiration for me. Thanks to all of you ladies for getting together and offering the candy it is much appreciated. Sharon, I love your romantic card! So pretty! My style tends to be CAS. Oh boy that washi tape is wonderful! Thanks for the opportunity to win. My style is CAS. Happy New Year to you! Thanks for an opportunity to win a great prize package. My favorite style would probably be described as “romantic”, lots of cutouts, lace, doilies, hearts & flowers. My style is clean and simple BUT my favorite cards to view are those that use embellishments so artfully…something I haven’t mastered! CAS would best describe my style…your card is beautiful. Thanks for the inspiration and chance to win also. I guess my style is fun. Anything that brings a smile or laugh. Loved the beautiful heart and key card. I will have to try that for my Valentine. My favorite style in “Clean and Simple”. I love cards that can be easily duplicated and given as sets. Thank-you so much for participating in the blog hop and I pray you have a prosperous New Year. Gorgeous Valentine card–I like the dies you used. My favorite style is clean and simple. It’s so hard for me to pick a single style. One week it’s vintage and the next it’s CAS. I guess I just love it all! Thanks so much for sharing your wonderful creations daily. I love checking your blog to see what’s new. Thanks for offering the huge bundle of goodies for a prize. Someone will be very lucky. Wow, wonderful giveaway! My ” only pick one” style would be elegant. Thanks so much, Sharon. Love your cards. Always drool over the CAS as that is soooo hard for me. Sharon, beautiful projects and a great prize!! I love the vintage look, but tend to create clean and simple designs. Also, the link to my blog is incorrect, it should be http://bethpingry.com, thanks!! Wow, only one style…..I guess blingy. Seems like my cards have to have some kind of shine. Thanks for chance to win! Well unfortunately I do not have ONE true style of card making so I go with the ‘umbrella term’ of Eclectic! However, I do LOVE my layers, the more the better! ðŸ˜‰ Happy New year! That is a very hard question. My secret is that the paper talks to me. Some days my cards are CAS and others it is, pile it on. If I have to just pick one, I would have to say CAS with texture. Really awesome giveaway, thanks for the chance! My card style clean and simple. Happy new year!! Picking just one style is really hard. I think if I had to choose just one, I would go with a cute style. I have a ton of cute stamps (especially adorable critters!) and I just can’t help but buy more. My favorite thing about card making is that I don’t have to pick just one ðŸ™‚ … however, I’d have to say clean & simple, since those are usually the quickest to make & easiest to mail. So good to visit you for the new year … wishing you all the best. Too many to pick from…thank you for the opportunity…everything is fabulous. If I had to pick one card style it would be CAS. I love so many, but there’s just something about CAS that sings to me. That said, your Valentine is jaw-dropping. I LOVE that gold heart! It looks like a tiny little metal jewelry box or something. Amazing! Thanks so much for the chance to win! Happy new year to you! If I had to pick one? Clean and Simple. Happy New Year! I love the texture and dimension on your card…so very pretty!!! Happy new year to you! Happy New Year. My style usually leans toward Clean and Simple. I enjoy seeing cards with lots of bling and layers, but quick and easy CAS works best for me. Thanks for the opportunity to win some great blog candy. My favorite card style is a pop up card. Love your card! I am more the clean & simple style! Happy New Year! I love cutesy like Amy R’s work really speaks to my style. What a beautiful card – and lovely giveaway! A year ago I never would have said so, but if I had to pick one style of cardmaking, I would now go with clean and simple! Happy New Year to you! I love to make clean and simple cards simply because they are the easiest for me to make. Your card is truly fabulous though! My style is more irreverent than frilly and gushy. If I can express myself in a funny way I’m happier than if I have to be fancy and proper. I love your valentine. The heart and key look so metallic. You would not think it was paper. the prize package is great. Going to need it for my Valentine’s cards. thanks for sharing. Super Gorgeous card! If I had to pick one style of card it would be mixed media and I plan to do more of that in the new year! Happy New Year & thanks for the chance to win! My favorite style would be romantic…. which is what I would consider your BEAUTIFUL card!! Thanks for this Great blog hop and for the inspiration! I am going to put your blog in my favorites and plan to visit you often!! Stunning card! My favorite style is vintage/shabby chic. Thanks for the generous prize chance. Happy New Year! My favorite style is clean and simple usually because they are quicker for me to make. BEautiful card! Love it! thank you! What a darling card, especially love the gold mirrored c.s. and Thank you for the opportunity to win your eye candy. Happy New Year! 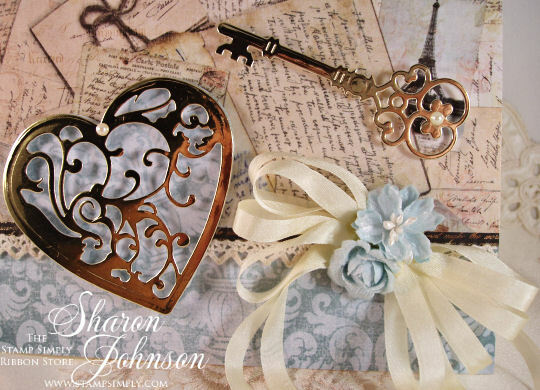 I love all styles of cardmaking, but shabby chic or vintage is one of my favorites. Thanks for the chance to win. Happy 2014! I love your Valentine! I always enjoy seeing the pretty cards on your blog. Thanks for the hop and chance to win. My go to style is CAS, because I mail a lot of my cards, but I love the layered and detailed cards also. Happy New Year! What a stunning card, Sharon! Thanks for a chance to win this gorgeous collection! Happy new year! CAS is my favourite type of card to make, as I always am so busy, just like everyone else!!!! Such a great giveaway, just in time for the next holiday, Valentine,s!!! I love the CAS style of cards. Wishing you all a happy new year of crafting fun! My heart loves shabby chic, but my linear mind usually wins the creative battle and I end up with CAS, all neatly lined up! Happy New Year Sharon. Love the card, esp the mirror card stock. Thanks so much for the chance to win such a wonderful giveaway! I have been trying to figure out my style for a while. I really feel I’m all over the place. lol I’m really not CAS. I guess I would have to say that I love using layers. It’s hard to pick one style, but I guess it’d have to be CAS cards. Vintage looking including distressed is my fav type of card. Thanks for the chance! Happy New Year! If I had to pick only one style, it would most likely be shappy chic. I like the distressed layered look. Beautiful card. I am a FB follower, I have been a blog follower and feedbiz follower for a while now. I have also ordered from you before. I LOVE your fabulous card. Happy New Year! Thanks for the chance to win….oh and my style is whimsical I beleave. I like CAS but I can’t stop once I get started, lol. I like to keep things clean and simple, so stamping mostly :). My favorite still is lots of ribbons and glitter. Bright colors. I don’t have a go to style. I like bold colors, buttons and bling. I like CAS, but I don’t do CAS. Fabulous blog candy. Thanks for the chance to win and I hope you have a wonderful 2014. Me, I like to make clean and simple cards, but I find I really admire fancy ones with flourishes and bows and many layers. Mabye I am just lazy! Your card is beautiful! My favorite style is CAS. I am just a clean and simple kind of girl. Thank you for the amazing giveaway! Totally love that card. Will have to get the key and heart lock, they are so beautiful. New follower thru feedly now. I guess I would say I love making cards using rubber stamps! Thanks for the chance to win! I would have to say CAS is my favorite style. Lovely card and wonderful prize! I think I keep most of my cards CAS, but I love small embellishments and fun, bright colors! The Blog Hop is a wonderful idea. thank you for the chance to win. My favorite cards are ones that are cute and make you want to keep looking at them. SIGH! Your card is absolutely stunning!!! Love the colors and the papers are divine!!! Would feel very blessed if I was lucky enough to win this incredible prize package!!! The seam binding is delicious as are the other items!! I am a new FB follower and also created an account so I can get your newsletter and follow you! Happy New Year !! I would have to say that my favorite style is vintage. I love the aged color and prints of the paper and laces. I love vintage items, but haven’t quite developed a real style yet as I am very new to crafting. Love the card and the inspiration. Thanks for sharing. My favorite card style is clean and simple, and collage/layered is a close second. Happy New Year! I am a CAS girl all the way!!! This is great! I am a first time visitor but I can tell you that I will be back. Thank you! Beautiful card. I love all styles of card making. It gives you permission to play outside the box. Thanks for a chance to win your prize. I would have to say my style is very grly. I love sparkles! Happy New Year! Wow! What a beautiful project and fabulous blog candy! I’m a clean and simple kinda gal, but love to try new techniques too! I’m pretty devoted to clean and simple. While I enjoy looking at cards with lots of layers or lots of coloring, I just can’t get myself to do that. Thanks for the chance to win that generous prize. What a gorgeous card. Thanks for chance to win. Happy New Year. My style is very girly. Love sparkle! frilly layers is my style. happy 2014. thanks for sponsoring the hop. My fave style for card making would have to be CAS. Thanks for the chance to win some lovely blog candy. Gorgeous card. My favorite style to make is CAS, but I love the look of shabby chic. Maybe someday I’ll give that a try too. Thanks for sharing and the chance to win. Very inspiring projects. My favorite style is simple and elegant. Thanks for sharing and for the generous give-away! My favorite style is shabby chic! Happy New Year! oh my! What a fantastic giveaway! in answer to your questin, well, I guess it would be vintage…although clean and simple might be a close second.. LOL!! My thought when I saw your Valentine card was Wow. I subscribed immediately. Thank you for allowing me to discover you through this blog hop. May 2014 be all you want it to be and more. love your creation… I am a follower and email subscriber… My fav style is by color… I see a color combination and that tells me exactly what it wants to be. A beautiful giveaway! My favorite style is shabby chic – love all the lace, ribbons, and layers! Coloring with copics and paper piecing are my favorites. Awesome give away. Happy New Year! If I had to pick just one style, I would say I lean towards “clean and simple” the biggest share of time. Wow, it is hard to narrow down to one style….but I would pick lacey, vintage. Thanks for your great site and for all the samples we get to see for inspiration. The new giveaway would be perfect for Valentines. Thanks for sharing! I love lot’s of texture! Layers and Bling! I would have to say….my favorite style of card making if I had to pick one would be CAS! I love that Valentine card. If I had one favorite, it would be creating scenes with stamps, but I also enjoy sketches and creating from them. Wow…what a stunningly gorgeous card!! Beautiful soft colors…and that heart is to die for!! I love Spellbinders dies…gonna have to grab that one!! If I have to pick one favorite style…I’d have to say CAS! Probably technique driven style. Beautiful card! Love the key and heart. Thanks for a chance to win. My favorite card making style is flourishes and delicate, fancy die cuts. Great giveaway! Thanks for participating in this awesome hop! Wow, amazing card! Simply gorgeous! I love how you cut the dies on the gold mirror cardstock. They really stand out. I’m new to your blog. So glad to have found you on this blog hop. I’m your newest follower. Can’t wait to see what you have in store for the new year. If I HAD to just choose one style of card making it would have to CAS style. Thank you for the chance at winning such a generous giveaway. Happy 2014! I’m a CAS girl! Thanks for the chance to win! Just bought that die the paper in this hop would make a beautiful card. Looking forward to it. GORGEOUS GORGEOUS card! Lovely giveaway in my FAVORITE color! I couldn’t figure out what my style was until someone posted a list on fb and I went aha! I think my style is Clean Layers and that’s usually the style I fall back to although I love so many different ones. HAPPY NEW YEAR! CAS…oh my goodness. thank you for the continued inspiration. blessings!!! Your Palestine card is fabulous. Love the gold heart and key and beautiful bows. Thank you for hosting the blog hop and the amazing blog candy. Happy 2014! Beautiful card! My go to style is simple elegance for card making. Clean, simple and beautiful. If I had to choose I would say the intricate ones either layering dies or 3D ones, a lot of work but OH SO WORTH IT! Have a Happy New Year and thanks for the chance to win this awesome candy! My favorite style is shabby chic. I love the romantic, vintage feel to it. I love to make fresh, fun and cute projects that’s my style. Thanks for the lovely prize. I like clean and simple. I would have to pick clean lines, with layers, and mixed patterns. Happy New Year! My favorite card style is layering and using dies. Your card is amazing! Love the gold heart and key! Gorgeous card! I would say simple chic would be my card style. I do layer a lot though. I would love to win your yummy, yummy prize! Thanks for the chance to win such a great prize bundle. I do quite a bit of layering on my cards but do try to watch when they are to go through the mail. Enjoy your blog! My style is clean and simple, not very fussy. I love your giveaway that’s perfect for this time of year. Thanks for an opportunity to win. Currently my cards are CAS; however, I am going to try to add more techniques and layering. I find it hard to just try it and not worry about the end result until I am done. Have a great 2014! Thanks for the chance to win. I’m definitely a layering card maker. I’ve always wanted to try CAS but with all the stamps and dies I have, I feel like I always need to add something else. Happy New Year and thanks for the giveaway! Gorgeous card with beautiful details! Not sure I can pigeonhole a specific style. I think CAS is my preference, but I sneak some other styles in on occasion! Not sure how to describe my style! I like layers, but not a lot of embellishing. I try to keep things clean and simple since 95% of my cards are mailed. Thanks for the chance to win, and for being part of this amazing hop! Your card is gorgeous! I design for several companies, and they’re all completely different, so it’s so hard for me to pick one style. But, to play by the rules ðŸ˜‰ I’ll say Clean & Simple is my fave! Simple and elegant is my style; but I love using Spellbinders, embossing folders and ribbons and jewels. Thanks for the chance to win blog candy, and happy new year! your style card making has caught my eye for the past few years.Very classy & elegantYour valentines card is stunning. Happy New Year Sharon! Love your pretty Valentine card! 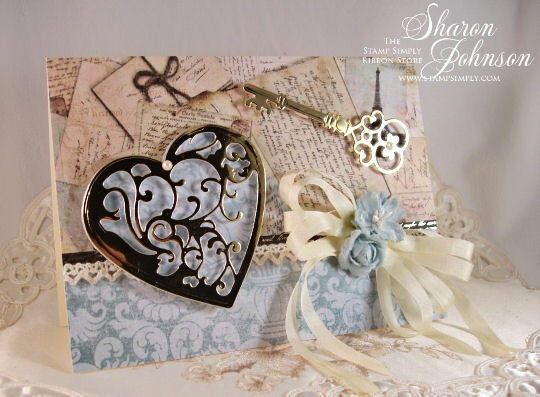 The blue patterned dsp is soft and pretty and the gold heart die is perfect. I haven’t quite put a definition to my card making style yet. I’d have to say my style is personal based on the season and person I’m giving it to with lots of texture and attention to detail. I enjoy all styles however. Wishing you all the best in 2014! My favourite style would have to be clean lines with lots of stamping. CAS would be my guess, although I like to layer too. Blessing to you and your family. Thanks for a chance to win some nice things! I am a 1st time visitor. i already have plans for the entire package. just ordered some of this line mme today. need these to go with. thanks for my chance. I’m not sure if I have a real cardmaking style. It depends on who I’m making a card for I guess. I like whimsical, but not too cutesy? haha That’s a tough question. At any rate, I love your prize pack of Valentine goodies. Thanks for the chance to win! Oh to pick one…would have to say vintage and layers..but love textures. I have to have something to feel or move. Even though I do add embellishments and such to my cards, I’ve been told that my style is CAS. Yikes! My paper crafting style is CLEAN & SIMPLE, although I am trying to branch out a bit ðŸ™‚ Love your projects! Love the card with the hearts! Happy New Year and thanks for the chance to win. I love clean and simple cards best. But I also love trying something new! Such a gorgeous card! My style is anything with bold colors! Wish I could master vintage like your awesome card! Hi there! Great prize pack!! My favourite card style would have to be clean and simple….I’d love to be able to do collage style but I can never pull it off! My favorite style is layered with lots of fun designer paper. Thanks for the chance to win!! Love your cards and thank you for the chance to win. My card style is trying to keep things simple. I’m not an expect in collage style. Style – traditional – clean lines and layers! Thanks! My style is usually rounded corners and lots of layers and definitely use of spellbinder dies. Have a lot of them and use them every chance I get. Gorgeous card, so fun to see all the pretty Valentines popping up!! To pick one style…well “vintage” I would say, but for some reason I don’t do much of it…interesting! 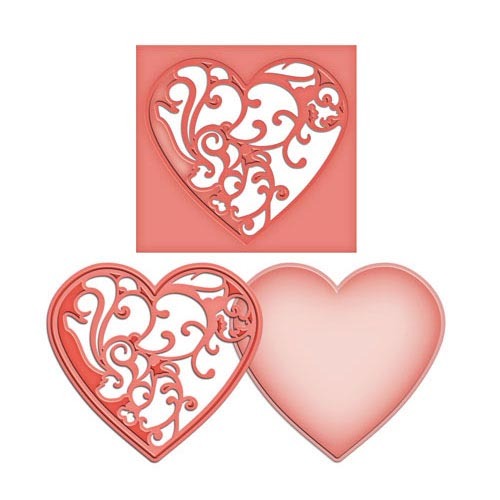 Your valentine card is beautiful – love the heart and key die cuts. My style would be considered shabby or vintagey (is that even a word?!) I love to use creams and soft pastel colors with lace, buttons and bows! if I had to pick one- shabby chic, love it… great card and giveaway. thank you and happy new year. Happy New Year and thanks for the opportunity to win some great crafty items. I have to say that my favorite is CAS like others have stated. Sometimes I’m on a tight deadline and that is the only way I can accomplish my goal. My fave style of card is CAS…it seems to be the only style I can manage…but I want to work on different styles! Thanks for the chance….Happy New Year! Pretty card!! Love it!! I love the CAS style! I like lots of different styles so I don’t really have one, but I am always drawn to Sharon’s simple and feminen creations. Beautiful card, I love the layering! I like to make classic style cards with bits of patterned paper layering> Happy New Year, everyone! I guess my favorite style is layering with some dies or embossing folders. My favorite kind of card includes lots of different techniques. I can’t choose a favorite. It all depends on who is receiving the card. Thanks for the opportunity to win. Happy new year! Thanks for the chance to win. If I have to choose one style, I’d go with mixed media – it seems to give me the greatest flexibility and range of techniques. Such a gorgeous valentine! LOVE that die cut key, it’s so elegant and it looks so real. So hard to have to pick one style of card. I really like CAS when done well. Some people can pull it off and make it look amazing and some people can’t quite make it look finished. Sometimes I can do it and most times not. Thanks for the chance to win. What a gorgeous card! thank you for the chance to win! Happy New Year and what a great way to start the new year. Love the card, the layers are really made well, the flowers are just wonderful. TFS and the giveaway too. I don’t know what my favorite is… I want to like Clean and Simple the best, but mine always look like they’re missing something. I would say that my style is clean and fairly simple – I do add embellishments but keep them flat enough to survive mailing. Your card is amazing. Lovely candy too. Follow you with bloglovin’ and Like you on FB. My favorite style of card making is Clean and Simple and I like to use a fair amount of white space. I enjoy colorful cards and watercolor backgrounds. I like C & S, but also to use copics or watercolour on images & backgrounds. I’m just back from visiting family, and catching up from missing so many posts! Oh my goodness! I have a lot of blog hopping to do. Thank you so much for all your inspiration & HAPPY NEW YEAR! My style is whatever speaks to me at the moment I sit down to make a card. Kinda CAS with a bit more. I make and use a lot of tags on my cards. Wishing you a happy, healthy and prosperous New Year. After years of card making, I’ve evolved to making elaborate layered projects with multiple dies……and of course, lots of embellishments,too. I like a card that keeps my mind and eyes busy looking at all the dimensions and features. It always causes me to use a lot of my supplies that I’ve been hoarding or reluctant to part with. LOL. My card-making style is definitely clean and simple. Thank you for a chance to win! This blog hop has been so much fun! Lovely project! I think my style is simple with bright pops of color, but I love lots of different looks. Thanks for the giveaway! Your card is quite stunning! I love all of the elements on it. My style is definitely Clean & Simple. If I try to do more it just turns into a mess! Thanks for the generous giveaway. May 2014 be a happy & prosperous for you! Wow, this is soooooo pretty! I love the vintage look. Amazing! If I had to pick only one style for my card making, I’d definitely pick vintage. I just love it. I like most everything and but at the end of the day … I always find I come home to Clean & Simple. Thank you for the opportunity to win such nice prizes. Looking forward to more inspiration in the coming year! Wow, what a great way to start off the year with awesome candy! I am not sure what I would call my style. I feel I like clean & simple but I am dabbling in a more layered and collage style. Thanks for a chance to win. Very beautiful Valentine’s Day card. Please and thank you for the prize package. Your Valentine card is gorgeous!! I do like Clean and Simple cards but I also like vintage. Thanks for the chance to win! Right now, I am into Vintage. I think it can be romantic, shabby chic or fun. Your Valentine card is beautiful….in fact all your cards are beautiful! Thanks for the chance to win such a nice prize package of products. Happy New Year and the best to you always. To date my favourite has been Vintage but have really tried to follow and learn from bloggers who are CAS – this is what I would like to do more of. I love the elegance of it. Happy New Year to all, this Hop had me all excited and so glad to see that us International crafters can enter, thank you, I was getting so disheartened by so many on the way saying US only. You did a such wonderful job on your cards!!! WoW!!! Valentine’s Day is my favorite day to send cards (with Christmas being a close second) to show everyone how much I love them and my favorite style is vintage! That is a beautiful Valentine card! My favorite card style is definitely Clean and Simple! Happy New Year! My favorite style is clean and simple. Thanks for a chance to win this awesome giveaway! Gee, if I could only pick one style of card to make it would have to be CAS. I have limited time to craft at one time so I tend to make CAS style cards. I would love to have time to do more indepth cards, but I will take what I can get. ðŸ˜€ Thanks for a chance to win. OH my gosh!! This card is awesome and yes I thought those where real metal embellishments. Super awesome! Thanks for a chance to win! My style is usually very cutesy and simple. I’m new to cardmaking but I love it! Thanks for the opportunity to win. Happy New Year! Gorgeous card, I love that mirror cardstock, so elegant on the heart! I’d have to say my go to style is clean lines and cutesy! Thanks for the chance to win! Oh my!!! Gorgeous card!!! I would say my favorite style is shabby chic. What a beautiful card! Thank you for sharing. I love layering on my cards – with different cuts. Happy New Year and thanks for the chance to win really great blog candy. hi, happy new year…im still new in papercrafting world but i love cards that have simple yet nice designs and i really love embossing :)..
WOW, gorgeous card!! My most favourite style of card to make is Vintage. I love anything vintage, and cards are no different. Your card is gorgeous! 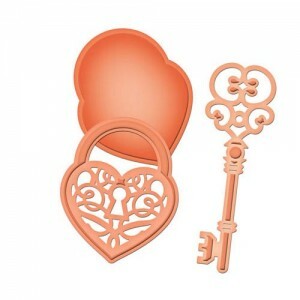 I can’t believe that the key and heart are cardstock! They look amazing! Thanks so much for sharing! I love to use die cuts and patterned paper on my cards! Those are the things that make it fun for me, then add a few gems/pearls and maybe a ribbon and it’s good to go! Thanks for the chance to win! Wow great cards! I would have to say that I am a very traditional card maker! Trying to break out of my box. That can be my resolution! I am just starting into making cards. My favorite style is scraplifting someone elses awesome designs! Stunning card! Thanks for the blog candy offering! I love doing layered cards with mixed elements. Happy New Year! This card is beautiful! I love the fact that it is not the traditional red or pink.. blue is simply lovely. My favorite style is CAS! But I do love all styles but try to keep it CAS.. I was hooked on stamping ever since I bought my first stamp in 1985. I’ve been through a lot of cards but usually it takes me forever to make one…days and days. Consequently I am trying to make more clean and simple cards and avoid the ornate ones. If I have to pick one, I would say that CAS is my favorite style. Happy New Year and thanks for the chance to win a great prize package! I love the valentine card. It is so elegant. Thanks for being so generous with your blog candy. My style of card making is Simple. I am still learning. Favorite style… clean and simple. Beautiful card! I would say my style…because I can only pick one…is clean and simple! Beautiful giveaway also! My favorite style of card is clean & simple. Stylized & to the point. My favorite style is Shabby Chic, Although I haven’t quite mastered it myself, I certainly enjoy blog hopping to see others accomplish this beautiful style. TFS your fabulous cards, Sharon, and thanks for the chance to win this awesome prize! I am such an eclectic cardmaker that it is a hard question to answer, but I tend towards CAS if anything!! Love the card you made – it is a stunner! Love the golden key! Lovely card! My favorite style of card is vintage and artsy. I love inking, doilies and flowers! My ultimate favorite card style is the very feminine vintage look. I love the soft colors, lace, beautifully written sentiments; the whole nine yards! Sharon, I absolutely love your site as you organize products, in my opinion, in the perfect way for us to find what we are looking for! The cards youi personally make are real GEMS! Happy New Year and thank you for a wonderful blog. Left too early, sorry. My favourite style is clean and simple. What a stunning card! ðŸ™‚ My style is CAS, hands down. However, I truly do love something about every style. ðŸ˜‰ Happy New Year! Oh, that card is stunning! I’m gearing up for valentine cards and your prize would certainly be nice! I love all styles but find myself leaning toward either vintage or cutesy! I don’t know if I have a style. I seriously like trying all things. My favorite style though is Vintage looking with the laces, ribbons and soft colors – that is why I love coming here! I love the new “Clean and Simple” style, but my favorite would have to be Shabby Chic, with all the layering, ribbons, soft florals and colors. My favorite style would have to be clean & simple, one layer cards. I love the look of more detailed cards but just don’t have the “talent” to pull that off! Thanks for the chance to win! Loved your card! I really like to to make gender specific cards. I am a pastors wife, so I make quite a few as the need arises. Wow, it’s such a great blog hop with so many different bloggers! Thanks for being part of it ðŸ™‚ I am new to card making and learning lot new techniques, what I can say for sure – vintage is still a challenge for me, but I am trying ðŸ™‚ Happy 2014! Your Valentine card is just so very, very pretty. Love it. Thanks for offering such a lovely blog candy prize. I am a brand-new follower by BlogLovin’. Yippee!! I just love your products, Sharon, and your are so good at getting the orders out post haste. Thank you so much for the work you do. I love your blog, I visit it often. I have you on speed dial. Thanks for an opportunity to win the giveaway. I don’t know how to call mine but I just love cute with lots and lots of layers. What a gorgeous card! I don’t have just one favorite style, really, but I would say I do do a lot of clean and simple! My favorite card style – SIMPLE! Thanks for the chance to win! I gravitate towards CAS. Thanks for the chance to win! Lovely card. Just love the heart and key. Thanks for all the fun. I like to make Clean and Simple (CAS) cards myself… but don’t always achieve the look! Just came across your site and LOVE it!!! My style is Victorian and your give away would make lovely Victorian creations. Thanks for sharing. Very generous. Thanks for this giveaway! Mine would have to be eclectic…its whatever at the moment!!!! Your card is stunning! So gorgeous. My style is mostly just your basic cutesy style with lots of layers and not many embellies. Thanks so much for the chance to win. my style is CAS but sometimes, I did stretch a bit with embellishment here and there according to the challenge requirement. 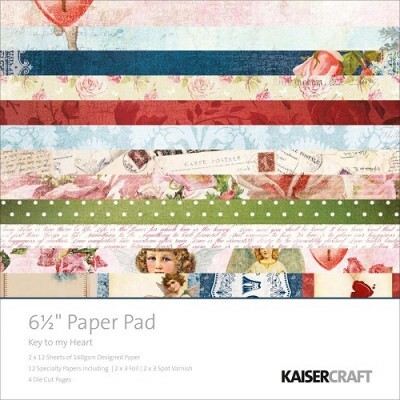 Thanks for the chance to win my favourite scrapbook manufacturer paper collection….!! !Keeping all my fingers crossed! My favorite sytle of card is CAS. Love your card and thanks for a fun giveaway. I’m not frou frou so I like layers with solid and printed papers and stamps and brads or dots. No lace, doilies, pinks, ruffles. My fav colors for cards red, black and white. Gender neutral. Is that a style? My Christmas cards are almost always whimsical, but I also use a lot of floral designs on cards. I guess I’d lean toward a simpler style. Your card is simply beautiful! I love all kinds of styles, mixed media, embossing, plain to fancy! If I HAVE to choose just one i would have to pick fun/cute… but that is not an easy choice since I am partial to several styles! Thanx for sharing your beautiful card and thanx for the chance to win all of those wonderful supplies to be able to make my own!!! Happy New Year!!! Hi Sharon!! Just wanted to stop by and wish you a very Happy New Year!! Hugs!! And omgosh of course that card is just pure elegance!! Gorgeous!! Gorgeous card! If I can only pick one, I guess it would be vintage/elegant. Thanks for the chance to win that lovely prize package! I am new to crafting so I am still finding my style but I do love vintage style cards. Love, love, love this!!! Oh what fun I am having jumping from blog to blog. Thank you for the opportunity to participate. I would say my style of card making is more simple. I use stamps and layers. My brother and his family surprised me at Christmas with a big shot so I new to dies but I am learning a whole new style. Words cannot express how much I love your card! I’m so excited to see the supplies are available for sale. My style seems to change with every card or layout I make, but since you are making me pick one I will say “vintage” because I am so drawn to it. I love to layer everything. Thanks for the lovely giveaway!!! Hi Sharon! Your card is just beautiful! My favourite style would be layered cards. Thanks very much for the chance to win this awesome prize package! Happy New Year! Happy New Year! My style would be considered clean and simple. Thank you for the opportunity to win the bag of fabulous craft goodies. Wishing you all the best in 2014. If I had to pick only one style it would be shabby / distressed . Your card is lovely , thanks for sharing and a chance to win. My favorite style is CAS. I love a card that is simple and fun! My favourite style is Shabby Chic. My style is CAS. I like to showcase one image at a time on my cards. You prize package sure would help us all get ready for Valentine’s Day. TY for the opportunity and happy 2014!!! I would say it’s somewhere between CAS and cluttered – don’t know if there’s really a name for that. I like to try out new styles and ideas with inspiration from my stamping group, Pinterest and other publications I am subscribed to. Oh boy I can think of all kinds of things I could make with these item! It would be great have these items! My favorite card style is layered dimensional at this time but love them all. CAS is my absolute fav! Sharon, your card is fabulous. It reminds me of the Victorian era with the beautiful paper and bow. You hit this one out of the park. TFS. What a beautiful box you have created. I love the silver heart and key. So pretty and dainty. I love the colors you chose. They are so soft and give a warm fuzzy feeling! My favorite card design is simple with not to many elements. I do love to do sketch designs though as you can use any image and paper and all the cards turn out differently. Have a great 2015! !